We all know the story of the grasshopper and the ant. That age-old fable where a footloose and carefree grasshopper spends the warm months playing music and dancing while the ant tediously works away in preparation for the inevitable freeze. When the winter finally does roll around, the ant is comfortable and well fed in its home and the grasshopper is caught out in the cold, hungry and with no plan to make it through. 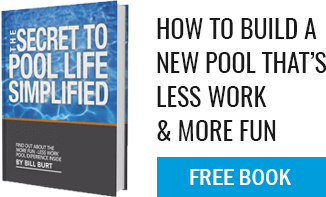 This is one of those cautionary tales that is meant to apply to all aspects of life and as pool builders, we take the lesson it teaches incredibly seriously. Building a pool is an architectural, engineering, and construction project like no other. It requires the careful installation of a large-scale backyard water feature that when executed correctly, will provide a lifetime of amazing memories and a serious boost to your property value. When done carelessly though, without proper planning and due diligence, a pool can be a disaster that is hard to shake. Do you plan on having or growing your family in the future? Perhaps a larger pool with an extended shallow section for the kids is something to consider instead of a lagoon-like kidney shaped pool with a 12-foot deep end. Are there going to be family pets and little ones running around? Designing a fence around your pool at the beginning of the project will save you money and another trip to your city’s permitting office. Not to mention, it will make your design appear more seamless and well considered. Are you an avid gardener? Consider using natural stone as deck material to accent the surrounding poolscape. Natural stone is long lasting and will blend wonderfully into many different landscaping projects. Take the time to interview and thoroughly assess the pool builders in your area. These are the people that will know your project best and it’s likely that you will nurture lasting relationships with these individuals to care for your pool when it’s time for updates. Just like any other construction project, building a pool takes time and involves the coordination of a number of different contractors all working to bring your vision to fruition. The most important item to remember is to take it slowly and imagine every possible design detail before you getting started. Planning ahead is the best practice when creating a pool that suits all of your anticipated needs.